Groovestar. Explore a new dimension in creating drums, beats and synthesizer loops. 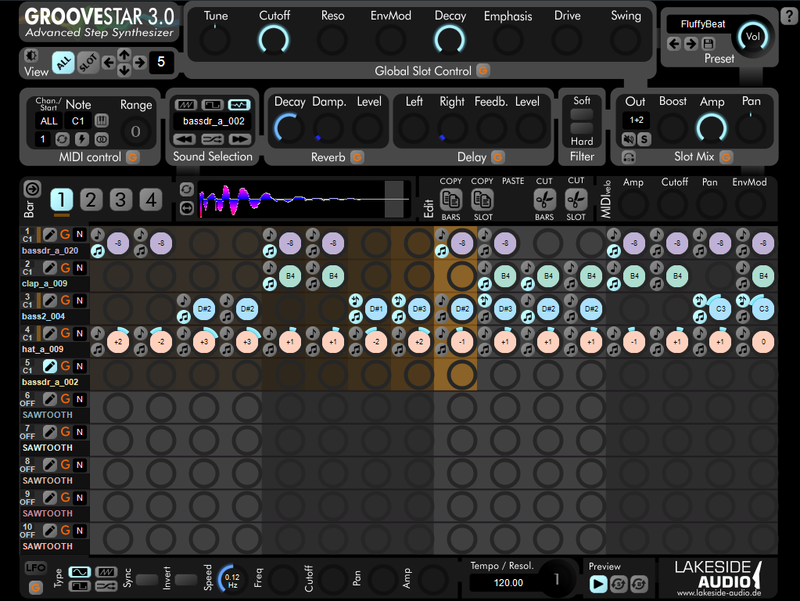 Groovestar is an innovative and new audio instrument/synthesizer plugin for creating drum loops and synthesizer sequences in a very intuitive way. It is based on the classic step sequencer idea but it features much more possibilities to create powerful patterns by using synthesized sounds as input as well as sampled wave sounds. You can treat and combine them to make hybrid sounds without any limitations. The plugin is controlled by MIDI events – you can map any created pattern to different keys or even combine them to play them simultaneously. Moreover it is possible to map a whole range of notes to a pattern allowing to alter the pitch of it – indepently if it is based on a synthesized sound or a wave file! Each slot comes with a 16 steps sequencer with individual tune, legato, reverse play, emphasis and tempo scaling settings. Each slot features an independent high-quality reverb, delay effect and compressor! Each slot has its own LFO for modulating different parameters, so you can use up to 100 LFOs in a preset! Each slot has 3 envelope shapers to modulate almost any parameter along the pattern. Every control can be automated or controlled by MIDI controllers with a MIDI learn function! Sample library with almost 2.800 bass drums, claps, snare drums, percussion and so on!! The current release of Groovestar V3.0 supports at least Microsoft Windows 7 and macOS 10.10 (64 bit) and comes as a VST plugin. Please try the demo version before purchasing it and feel free to contact us if you experience any problems installing it. The demo version will work for half an hour in total, and there is only a small audio sample library provided. Saving settings is disabled. The full version will come with about 2.800 drum wave samples like bassdrums, claps, snare drums, percussion and so on! Please regard that the only accepted payment method is PayPal. Please follow the purchase link above to buy a 5-digit activation code. After that you can activate Groovestar on your computer by clicking on the shopping cart icon within the plugin where you have to enter this activation code. Finally you will get a license file which you have to load into the plugin by clicking on the unlock button. Please regard that Groovestar comes with a node locked license, it can only be used on the host where you have unlocked it with the activation code. Of course you can use it on more than one machine, you can get up to 3 additional codes when you go for it - just contact us! We do not issue refunds for digital products once the order is confirmed and the product and activation key is sent and has been activated. Please contact us! We are looking forward to answer your questions. © Lakeside Audio 2018. 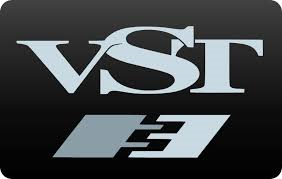 VST is a trademark and software of Steinberg Media Technologies GmbH. Windows is a registered trademark of Microsoft Corporation.